We're pretty excited today about some changes that have been implemented to our notification system. 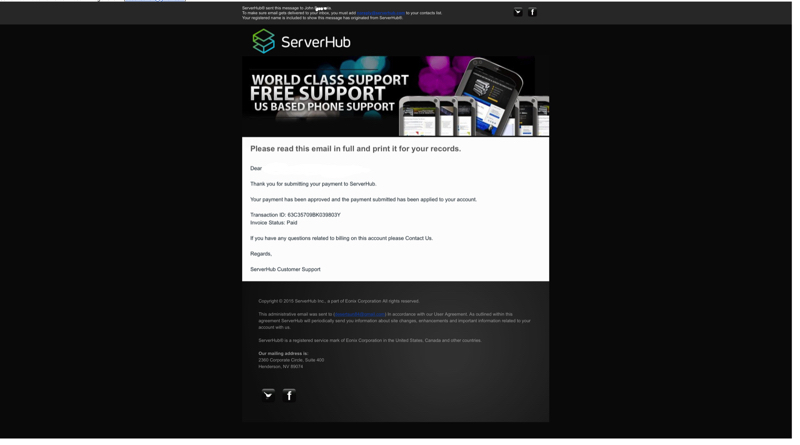 We've rolled out a new streamlined look and feel to all user interaction emails between our customers and ServerHub. Over the past several months we have gone through different variations of email templates of all colors, shapes and sizes with one goal in mind: Simplicity. When ServerHub launched the new version of it's website back in September 2012, all email templates were updated in tandem with the site launch to reflect the branding of our then current website. Fast forward to the end of 2015. A lot has changed in the email world, and simplicity and elegance is key to effective communication delivery. With that being said, starting today, active customers and new customer registrations will begin to receive a new streamlined email communication with every interaction with ServerHub. Simplicity: We've streamlined verbiage, message delivery is more clear and to the point. Easy to understand communication has been our primary focus. Our latest update encompasses the vision and spirit of our current ServerHub 2.0 Design and Framework. Delivering everything you would expect from our unification of ServerHub and HubGrid. The rollout of our new communication design has been completed and it has been implemented site wide. As with anything, if you experience any formatting issues or have any concerns please give us your comments. We hope you enjoy the new streamlined communication, may your inbox be filled with modern design!